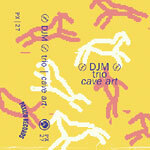 Cave Art is an engrossing blend of live covers from the DJM trio headed by Dominic J Marshall. The album covers hip hop and experimental electronic music from the likes of Jaylib, Flying Lotus, MF DOOM, 9th Wonder, and many other contemporary artists. 12 tracks on a 30 minute high-bias cassette tape. Includes digital download. Packaged with a utility candle for your ritual archeology needs and a Paxico Records sticker.